We have all heard how Masons stick together. Apparently. 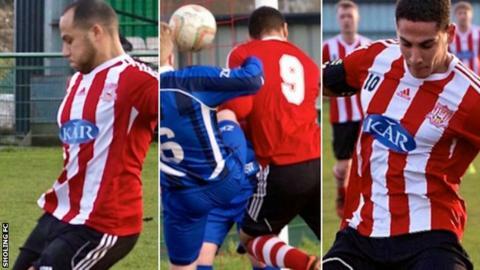 And the Mason brothers - Dan, Barry and Byron - of Sholing FC in Southampton did just that, when they all found the net in their side's 3-3 draw with Shortwood United on Saturday. The siblings are thought to be the first trio of brothers to all get on the scoresheet in the same match since the Fenoughty brothers all found the net for Matlock Town FC in 1978. Dan, a student at Solent University, put Sholing ahead in the Southern League Division One South & South West encounter after just five minutes, while a 25th-minute penalty from Barry - who works as a crane operator at Southampton Docks - made it 2-0. "We'd let the lead slip and gone 3-2 down, so my goal was the equaliser and we were just happy not to lose the game," Byron, the club captain, told BBC Sport. "It wasn't even until after the game and someone asked who scored the goals and I said 'me, Baz and Dan' that it dawned on me that it was just us three brothers. "It didn't even occur to me at the time. It's not until the after the game and then people were putting stuff up on Facebook and stuff, and then we got thinking about it. "Maybe when it all settles down, hopefully our kids will be able to look it up and see we made a little bit of history." Byron - an electrician by trade - has been at the club for eight seasons and had the honour of lifting the FA Vase at Wembley last season. Club secretary Greg Dickson said Byron's 84th-minute equaliser had almost seemed pre-ordained. "We were losing the game late on and our sponsor came down and told me the man of the match - Byron - which I announced over the loudspeakers," he said. "Literally 20 seconds later he scored the equalising goal so maybe it was divine intervention!" Dickson added: "I phoned the result in to the Southern League and said I've got a 'Masonic' scoreline for you, which confused the guy at the other end but he laughed when we went through the details. "We have one supporter with a special 'Three Masons' flag, but it only gets an airing when all three of them are on the pitch. "It's a totally different story - certainly different to what I normally put in the programme!"